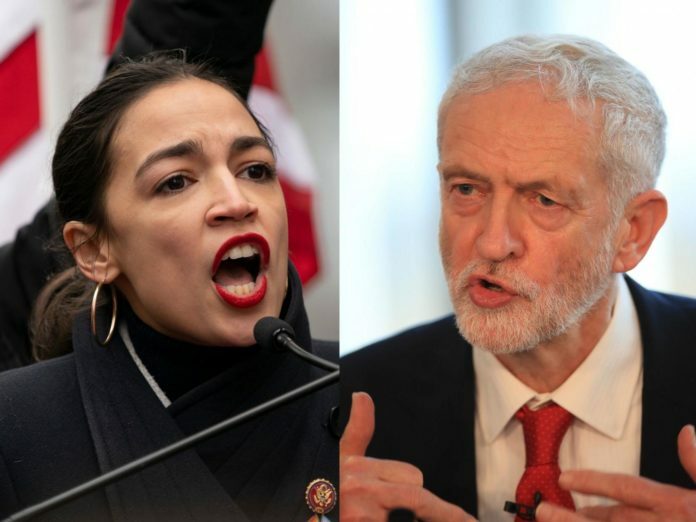 Rep. Alexandria Ocasio-Cortez (D-NY) has been criticized online after she held a phone call with British Labour leader Jeremy Corbyn, a staunch critic of Israel who has been accused of anti-Semitism. “Great to speak to @AOC on the phone this evening and hear first hand how she’s challenging the status quo,” Corbyn wrote on Twitter. Corbyn and his Labour Party have led the opposition against Prime Minister Theresa May’s plan for the UK to leave the European Union. Corbyn has been staunchly criticized for his leadership amid the ongoing Brexit negotiations. Polls have shown 85% of British Jews believe Corbyn is anti-Semitic, and responsible for the toxic environment inside his political party. He has honored Palestinian terrorists who killed Israelis, and met the mastermind of the Har Nof Shul massacre just weeks before the attack. He has urged British educators to compare Israeli actions to Nazi Germany, and has allowed that twisted belief to spread to his supporters. Elad Nehorai, a Jewish writer from Brooklyn, replied to Ocasio-Cortz, urging her to address Corbyn’s anti-Semitic history. Ocasio-Cortez thanked Nehorai for his concern. Be careful with the government, for they befriend a person only for their own needs. at the time of his distress. Corbyn’s policy with everything is everyone should be equally miserable. Haters sticking together. Is anyone surprised? This is what i call “Axis of Evil”.